A NEW YORK REVIEW BOOKS ORIGINALOne of the delights of Russian literature, a tour de force that has been compared to the best of Nabokov and Bulgakov, Yuri Olesha's novella Envy brings together cutting social satire, slapstick humor, and a wild visionary streak. Andrei is a model Soviet citizen, a swaggeringly self-satisfied mogul of the food industry who intends to revolutionize modern life with mass-produced sausage. Nikolai is a loser. Finding him drunk in the gutter, Andrei gives him a bed for the night and a job as a gofer. Nikolai takes what he can, but that doesn't mean he's grateful. Griping, sulking, grovelingly abject, he despises everything Andrei believes in, even if he envies him his every breath.Producer and sponger, insider and outcast, master and man fight back and forth in the pages of Olesha's anarchic comedy. 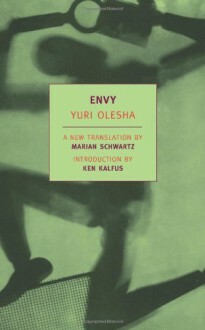 It is a contest of wills in which nothing is sure except the incorrigible human heart.Marian Schwartz's new English translation of Envy brilliantly captures the energy of Olesha's masterpiece.